Dental amalgam contains mercury, a substance that can be toxic. The silver color also draws attention to your fillings. At Kathy Zahedi, DDS & Associates in Santa Monica, California, Dr. Zahedi can remove your amalgam fillings safely and effectively with the Safe Mercury Amalgam Removal Technique (SMART). To replace your amalgam fillings, call or book an appointment online today. 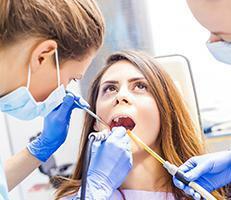 Why are amalgam fillings harmful? Mercury comprises up to 50% of amalgam fillings and is linked to a number of health problems. While amalgam fillings effectively repair cavities caused by tooth decay, if they become damaged they may also contribute to an increased level of mercury in the bloodstream, lungs, kidney, brain, liver, and gut. Studies have shown that mercury can interfere with the normal functioning of some important biological compounds, such as red blood cells, protein hormones, and enzyme inhibitors. Mercury can also affect your muscles and nerve cells. Amalgam fillings may also expand with time, leading to cracks and breakage in teeth, and they have the potential to negatively affect your nasal cavity, heart, blood supply, reproductive system, musculoskeletal system, and neurological system. The most common alternatives to dental amalgam are composite resin and porcelain fillings. These are healthier options that are easy to clean and maintain. These options are also designed to match your natural tooth color. Dr. Zahedi will discuss these alternatives with you and help you determine which option is best to replace your amalgam fillings. Dr. Zahedi removes amalgam fillings using the Safe Mercury Amalgam Removal Technique (SMART), focusing on your safety and taking special precautions to minimize your exposure to any harmful metals in the amalgam. Before she begins the SMART procedure, Dr. Zahedi assesses your medical and dental history and performs a comprehensive examination of your mouth. She examines your fillings, determines the pressure your dental area can accommodate and assesses your oral hygiene. If she determines that you are a candidate for amalgam removal, Dr. Zahedi performs the SMART chairside protocol, preparing you for your amalgam removal by properly covering you and placing a dental dam that isolates your tooth. This prevents the amalgam from making contact with the sensitive tissues in your mouth. She also places additional safety materials underneath the dam to intercept any escaping particles. She uses a mercury vapor ionizer to bind mercury vapors to a plate that is placed far from you. She then carefully suctions the amalgam. After removal, Dr. Zahedi inspects and cleans your mouth, ensuring that you don't absorb any escaped amalgam particles. To have your amalgam fillings removed, call Kathy Zahedi, DDS & Associates or book an appointment online today.